Born in Greece she studied at the Athenaeum Maria Callas Conservatorium and at the Kodàly International Music Institute, obtaining her singing diploma with a special award for distinctive performance. She went on to join the Greek National Opera Studio, where she worked with many distinguished opera directors, took part in masterclasses with celebrated artists including Monserrat Caballé and at the age of 19 made her solo debut as Ninetta La Finta Semplice and Clarice L’Amante di Tutte (Galuppi). She was awarded a place at the Opera Studio of the Deutsche Oper am Rhein where she made many role debuts, including the Königin der Nacht Die Zauberflöte. 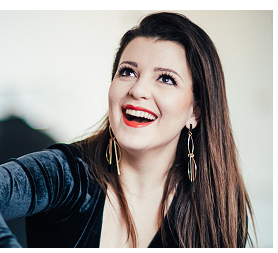 She joined the ensemble of the Landestheater Coburg at the beginning of season 2018-2019 where her roles include Königin der Nacht Die Zauberflöte, Little Red Riding Hood Into the Woods (Sondheim), First Niece Peter Grimes, Hannchen Der Vetter aus Dingsda (Künneke) and Frasquita Carmen. She made her very successful debut at Greek National Opera as theKönigin der Nacht Die Zauberflöte and returned to sing Königin der Nacht Die Zauberflöte for the Deutsche Oper am Rhein. Future plans include the title role of Lucia di Lammermoor at Landestheater Coburg. Bach JOHANNESPASSION; Pergolesi STABAT MATER: Händel LA RESURREZIONE. Yorgos Balatsinos; Lukas Beikircher; Giordano Bellincampi; Johannes Braun; Patrick Chestnut; Wen-Pin Chien; Vassilis Christopoulos; Markellos Chryssicopoulos; Ville Enckelmann; Roland Fister;Lukas Karytinos; Roland Kluttig; Axel Kober; Michalis Oikonomou; Marc Piollet; Jochen Rieder; Aziz Shokhakimov; Aleksander Sokurov; Christof Stöcker; Zoi Tsokanou; Andrey Yurchevych; Nikos Vassiliou. Suzanne Andrade; Jörg Behr; Alexander Charim; Spyros Evangelatos; David Hermann; Dietrich Hilsdorf; Guy Joosten; Barry Kosky; Esther Mertel; Alexander Müller-Elmau; Joan Anton Rechi; Tobias Ribitzki; Renata Scotto; Otto Schenk; Johannes Schmid; Tibor Torell; Alexander Vedernikov; Graham Vick; Philipp Westerbarkei; Franco Zefirelli.